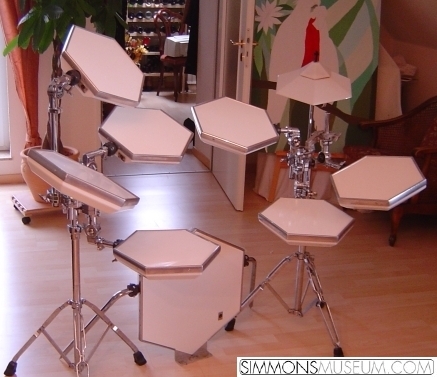 The first generation of the Simmons-typical hexagonal drum form. First exclusively delivered with the hard acrylic surface (black or white), later -named MKII version- with a rubber surface which was simply stuck on the original surface. Attention: There are two different uncompatible diameters for the tom arms: The first 5's had been delivered with original Pearl high quality tom arms, later with much cheaper taiwanese arms with less diameter (the ones known from the later SDS 8). The shells are coated from the inside. That means, the shells are transparent. The result is that they apear very nice and shiny although being scratched. Specials: Future style cymbal pad (see pics for details) which could be mounted on standard cymbal stands.